China, EU and UK central banks ease. Gold slides. What's it gonna take? Gold for delivery in August briefly dipped below the $1,600 an level on Thursday morning despite concerted central bank action around the world to flood markets with cheap money. China surprised markets with an interest rate cut, the country's second in less than a month. The ECB also cut rates. The Euroland move was less of a surprise but it did bring down interest charges to a record low and deposit rates to 0.00% – that's even easier money than the US Fed is providing. And to top of the supposedly great news for bullion – all which broke before markets in New York opened – the Bank of England announced another round of bond-buying similar to the quantitative easing programs in place in the US. The Fed's first round of QE was put in place in 2008 and in June it extended another of its money-printing programs, Twist, to the end of this year. Despite the stars aligning for gold take up its position of the ultimate storer of wealth, hedge against inflation and all-round best alternative to paper currency, the price declined. It now seems clear that nothing other than Ben Bernanke bringing out the big guns – QE3 – will satisfy gold bugs. Since QE1 the gold price has almost doubled, but what happens if QE3 does not materialize? As Tom Kendall, Director of Precious Metals Research at Credit Suisse said today: "If the market doesn't get the third bout of QE that it is predicting, the decline is likely to be more significant than what can be expected on the upside." 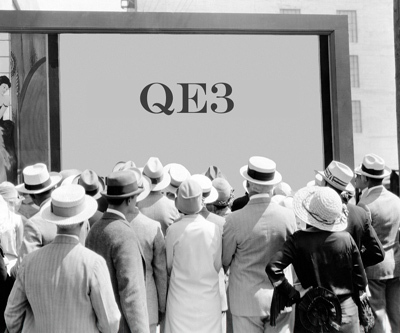 In short QE3 would great, but no QE3 will be disastrous. Perhaps today's move down is a sign gold traders are beginning to price in disappointment.